Here is the flagstaff on the stern again! I have found very few photos of the flagstaff and most were fuzzy pictures shot at a distance. None showed the area where the staff attached to the base. I had to guess how the mechanism worked for swinging the flagstaff horizontal to clear the helo pad for operations. I was looking through a ship's cruise book and found a photo of the stern lookout. In the corner of the photo was the image of the hinge mechanism. Maybe this will be the final iteration! I suggest that you may have the hinge correct, but the stern light located incorrectly. When at sea, the stern light should be upright, so it provides proper visibility per the rules of the road. The light on the flagstaff was the stern anchor light. It was a 360 degree white light. It was lighted only when the ship was anchored or moored. The white stern light was located in a recess in the hull at the stern, along with a blue formation light and a wake light. The stern light was visible through an arc 67.5 degrees to either side of directly astern. I get many requests to share my 3D models with others, sometimes several per day. Unfortunately, it is not a simple process. I use the DesignCAD 3D Max program to create the models, and it's native file format is incompatible with almost every other CAD and drawing program (as are the native file formats of just about every other CAD and drawing program). I can convert DesignCAD drawings to a few other file formats, but the conversion is imperfect and information may be lost. Materials and colors often are lost. And it takes a lot of time to make these conversions. Any time spent doing this work for others will delay my process of finishing the model. Furthermore, I began the model when 3D printing was in its infancy and there was no common 3D printing procedure. So most of the model was not created with 3D printing in mind. When I started DesignCAD was limited to files no larger than about 350 Mbytes. This was reasonable for most projects - I have a complete model of my house with all joists, studs, boards foundation, ventilation ducts, etc. and it is only 2 Mbytes, so 350 Mbytes was enough to model an entire subdivision. Later 64 bit DesignCAD versions can handle MUCH larger files - if you have the time and patience to work with huge files. 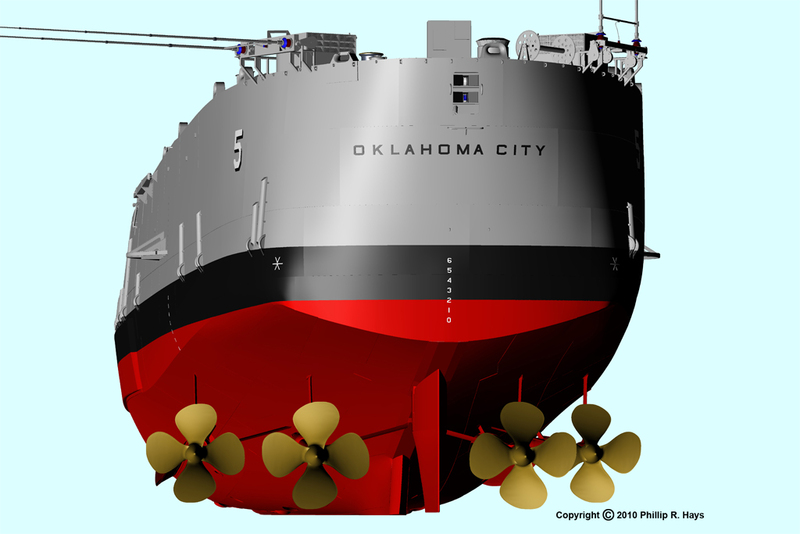 The CAD files for the USS Oklahoma City CLG-5 model are approaching a gigabyte. Just one of the radar antennas is almost 40 Mbytes. I have had to use a lot of shortcuts to keep the file sizes as small as possible. The model is composed mostly of zero thickness polygons and grids with "leaks" between surfaces and these cannot be printed. It has taken me 10 years to create the existing files. Conversion to real solids that are printable would take many years more. And that would delay the finish of the model. I simply do not have time to respond to everyone's requests. Just responding to requests has become a major time-consuming problem! If I stopped and responded to all of the requests all work on new parts of the model would stop - and I will not do that. So please do not ask! I will answer questions and help with any existing 2D drawings I have, but I will not take time to try to convert the 3D models. My purpose in creating this model is different from most modelling efforts. I do not want a "pretty good" model of the ship. I think of it as a "digital archaeology project." Like those archaeologists who examine historical wrecks under the sea and try to create drawings as accurate as possible to show what the ship was like, I want my CAD model to be as accurate as possible. I have spent years pouring over blueprints, photos and any other information I can find in order to create a representation of the ship as it was in July 1971. 1. I want to use the 3D model to produce accurate 2D drawings of every part of the ship. When they are complete and I am satisfied that they are accurate I will make them available to the modelling community. It will be years before this is done. 2. I will use the CAD model and 2D drawings to build a 1:96 scale model of the ship. If I generate 3D printable parts and photo etch patterns I will share them. But right now I do not think 3D printing has enough resolution for serious modelling - at least not anything I can afford. Maybe that will change. This is all years in the future. 3. I want to use the CAD model to create walk through videos so people can see what it was like to tour the ship. These may include animations to show how equipment worked - I can create animations with DesignCAD but it is a very time consuming process. 4. 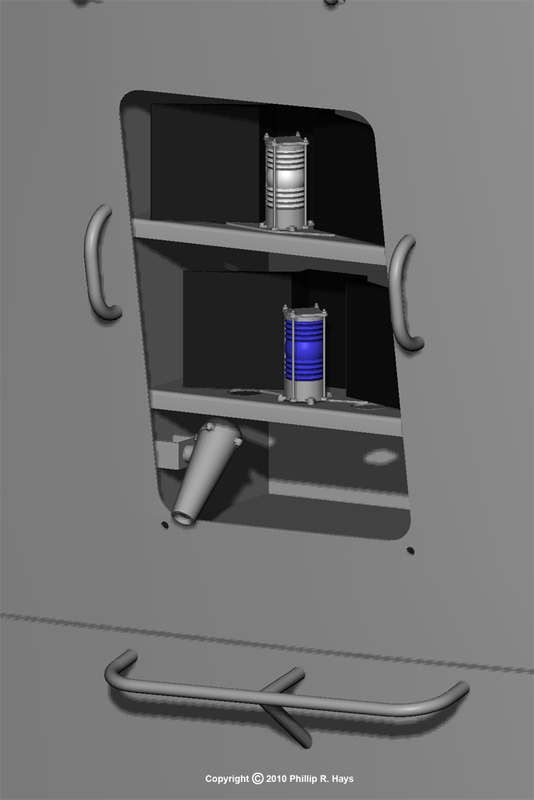 I may continue and 3D model some interior parts of the ship, such as the missile house, engineering plant, gun systems, etc. These will be used to extend the video walk throughs. 5. I want to start over with the USS Oklahoma City CL-91 in its configuration at the end of the war in 1945. If I live long enough! I have been working on several minor but tedious jobs to get the hull ready for the final finishing touches. There were several corrections and improvements to the focsle area, and I installed the angled flange at the edge of the main deck. The flange was a bit of a challenge because it is a basic "L" shape but with a varying angle. At the bow the angle is obtuse (greater than 90 degrees) where the hull flares out at the top. Amidships the angle is acute (less than 90 degrees) because of the tumblehome of the ship's sides (the beam is wider at the waterline than at the main deck). And it is obtuse again farther aft. In addition, the flange curves around the edge of the main deck, and it follows the sheer and camber of the deck. This sort of thing is hard to model with CAD. Then there were hundreds of rivets fastening the flange to the hull plating (it was welded to the main deck). 1. Life line stanchions. I have been studying blueprints and photos for a few weeks to make a list of types of stanchions and their locations. Unfortunately the CLG blueprints that tell where the stanchions were are extremely poor copies - large parts are solid black - and almost useless. To complicate matters further, even though some of the stanchions were the same as in the Clevelands during WWII, the blueprints are for the USS Cleveland CL-55 and the stanchion positions were rearranged by the time the USS Oklahoma City CL-91 was constructed. So even the Cleveland blueprints are mostly useless. I have been poring over photos to make a list of stanchion locations and types. Of course the details changed a lot over time so it has been a challenge to determine what was where in July 1971. 2. Life nets around the helo deck at the stern. The blueprints for these are pretty good and I have many good photos. 3. The wood deck. I intend to model every plank as accurately as I can. The blueprints give general guidance here, but I will need to study photos to determine where the ends of the planks actually were. I already have a 2D deck plan showing the planks and margin boards. I will notch deck planks into the margin boards, and that will be a lot of simple but tedious work! The deck planking for the 28 foot personnel boats taught me how to plank decks in CAD. There the planks were curved. All of the main deck planks were straight parallel to the ship's center line, but they still have to follow the camber and sheer of the deck. Then the model will be nearly complete. I still need to rework the AN/SPS-30 antenna on the aft radar tower, and there are a few minor fixes I need to make on the after superstructure. Thanks. Are you going to post any pictures of your Fletcher CAD work here? Just finished the main deck lifelines. It was quite a tedious chore. I also discovered problems with the boat decks amidships and had to redraw part of them. Fortunately the original blueprints are very readable with complete dimensions. Now on the the flight deck life nets! I also wont be doing a thread on the Fletcher as it will be too slow with work and grandkids etc it may take 20 yrs to complete rofl However I am about to start a thread on the Higgins LCVP Landing craft I have drawings for. I am sorta lost on the TOO they show but you can look there and maybe answer my dumb question lol. The ship had boat decks port and starboard at the midships deck house. I originally drew these a couple of years ago, but while I was mating them to the hull plating I discovered a few problems. Further examination of photos and the blueprints revealed even more problems (they had been modified quite a bit from the original construction). And then I realized that I had left out the diagonal supports for the boat rests. So what started as a simple job to allow me to finish the life lines and life rails on the main deck turned into a several day job. I have attached images of the decks without the boats to show details of the boat rests, and then pictures with the boats lashed down for stowage. The last picture shows the details of the boat supports and the diagonal braces. I finally finished the stanchions and life lines on the main deck! So how hard can that be? You just trim and glue some photoetch pieces in place, right? Well, two months and 108 stanchions later it is done, with 20 different basic types of stanchions and several slight modifications (with some distractions fitting the boat decks to the hull). Some were either a simple tube welded to the deck or inserted into a larger pipe section that was welded to the deck. Most were a more complex assembly designed to fold down by removing a pin on one side of the base and hinging on pins on the other side. This would lower the lifelines, presumably for UNREPS transfers or whatever. In practice all of the pins were removed and the entire upper part of the stanchion was removed, along with the lifelines. No two of these were exactly alike. They spanned a 15" waterway at the side of the deck, with the inboard end welded to a flat bar at the edge of the wooden deck. The outer end was custom fitted at each position to the upper edge of the hull plating and an "L" flange between the main deck plating and the hull plating. The height of the hull plating varied along the length of the ship. That is what took so long to draw! Forward and aft of the wooden deck there was no waterway and the stanchions were welded to the deck on the inboard end. Some of the stanchions had an upper extension to support a cable. In port canvas awnings were strung between the cable and bars (jack rods) welded to the sides of the deck houses. On the forward part of the ship these extensions were removed at sea to protect them from waves coming over the bow. But the midship stanchion extensions were in place most of the time. The stanchions add a nice finishing detail to the main deck. Now on to the life nets at the sides of the flight deck! The flight deck life nets are done! When I started this project I thought if I had the blueprints all I would have to do is model what was shown in the drawings. However, it wasn't that simple. I have the blueprints for the life nets on "CLG TALOS" (USS Little Rock CLG-4 and USS Oklahoma City CLG-5). They show one section of nets with six parts. But when I looked at the OK City pictures I saw two sections with eight parts - one with three nets and the other with five nets (see the attached pictures). Well, after years of working with the drawings I wasn't surprised. The OK City was modified a lot over the years! Looking at photos of the ship throughout her career it appears that the original CLG (1960) had one five net section, starting at the forward end where the blueprints showed the forward end of the six net section, but with the sixth net missing at the aft end. The ship still had only the one five net section in June 1967, but by April 1970 an additional three net section was installed forward of the five net section. Existing life line stanchions were removed where the new net section was installed. The Little Rock does appear to have six net sections where the blueprints show them, but they weren't constructed like the blueprints show them! So much for blueprints! You really have to study photos to see that they actually built. It often takes longer to study the photos and determine what was actually on the ship than it does to model it. I have started work on the wooden deck. The image shows the forward part of the deck. This was added during the CLG conversion between Frame 18 1/2 and Frame 23. The original Cleveland class wood deck extended forward only to Frame 23. The planks were 2" thick by 4" wide. The blueprints call for a 1"x4" teak board to be laminated on a 1"x4" Douglas fir board to form the planks. The Margin boards were a minimum of 6" wide and a maximum of 9" wide. They were 2" thick where the board joined a deck plank, and 2 1/2" thick along edges that butted against deck house sides. This caused water to run away from the metal house sides. There was a 3/16" wide caulking between planks, margin boards and house sides. Where an angle at the end of a plank was less than 45 degrees the point (nib) was cut back to where the plank was at least 2" wide, and this board was fitted into a notch in the margin board. There were three different configurations of this part of the wood deck in the CLGs. Two did not have the added forward part of the wooden deck and just the original Cleveland class bare metal deck. Two had only part of what is shown here on the outboard sides and bare metal deck in the center. And two had the full wooden deck extension shown here. And, of course, no two were exactly alike! This was the most complex part of the wood deck. The margin boards around the vents, hatch and winch/capstan controls were pretty complex. Adding to the difficulty was the raised edges of the margin boards close to the vents and hatches. Further complexity came from the fact that the main deck was hyperbolic - saddle shaped. It was curved from side to side, with the high part in the center. This camber helped prevent water from standing on the deck. In addition, the deck had sheer and was higher at the bow and stern than at midships - a broad "U" shape when viewed from the side. All of the deck planking and caulking has to be fitted to this saddle shape and around the margin boards. Here is a bit of Cleveland class trivia. The bitts shown here at the forward corners of the wooden deck were unique to the USS Oklahoma City CLG-5. None of the other Cleveland class ships or CLG conversions had them, so they are an easy recognition feature for the OK City. They are also odd in that they appear to be 10" bitts like those used on destroyers. All the other bitts on the ship were 14" (on all Cleveland class ships). It appears they were added during the CLG conversion. I guess the Chief Bosun's Mate wanted more bitts and they used whatever was available in the shipyard. Still a LOT more to go, one plank at a time. Many times during this project I have completed the design of one part only to discover that I had made mistakes when I moved on to the next part. This is why I am determined to finish the CAD model before proceeding further on the 1:96 real model. Otherwise I might spend a lot of time, materials and money only to discover that what I had already built would have to be scrapped. In this case, while I was working on details of the wood deck I discovered that some of the lifeline stanchions were in the wrong positions - and this was after weeks of studying blueprints and photos to try to get it "perfect." Foolish idea! So I went back and verified the positions of all the stanchions and moved those that were out of place. I hope they are right now. And then, while studying the photos I realized that I had made a mistake in fitting the deck planks into the margin boards. It is actually a bit simpler than I first drew. The attached picture shows the new boards and the positions of some of the lifeline stanchions that were moved. Last edited by DrPR on Thu Dec 22, 2016 12:03 am, edited 1 time in total. I checked out your website and found it very interesting and helpfull; whereas my CAG-2 build has much in common OK city. Your workmanship is outstanding. There is the right way, the wrong way and the Navy way! For many of the details like bitts, stanchions, searchlights, hatches, doors, etc. the same design was used on all ships of the period. I used blueprints for the USS Sullivans DD-537 to find drawings of a few things I couldn't find in the Cleveland class blueprints. The same radar antennas were used on many types of ships. However, there was also the shipyard way, and I discovered that many of the things shown in the CLG blueprints were done differently in different shipyards. So you really need to look at photos! I'm glad you are finding some of the things I have posted to be useful in your build. Awesome detailing mate!! I think you may need a really good magnifying glass when you start on the physical version!! There is no way I can construct as much detail at 1:96 as I have in the CAD model. In CAD I am modelling everything 3/16" or larger that I can find in the blueprints and photos. At 1:96 that would be 0.002". The really small details are rivet, screw and bolt heads. I probably won't try anything less that 0.008" in the real model - that's about 3/4" at 1:96 scale and some of the hand rails were 3/4" pipe.